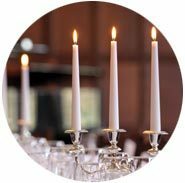 All of our rooms can be used in a variety of ways for your event requirements. 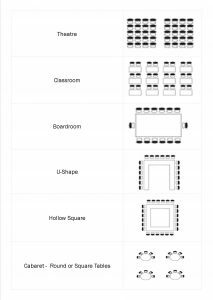 For a brochure with full information on layouts and capacities for each room, please contact the events team. 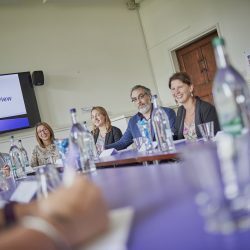 The total capacity at Westminster College for an event is 300 using all the meeting and dining rooms and at the Woolf Building the total capacity is 150. Visit our Gallery page for more images. 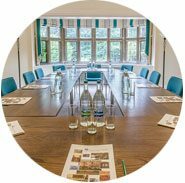 Most of our meeting rooms can be set up to suit your meeting requirements and we have listed the layout capacities of each of them for you to review with ease. 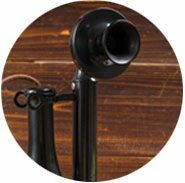 If you require a set up that is bespoke to your requirements, please do ask us. 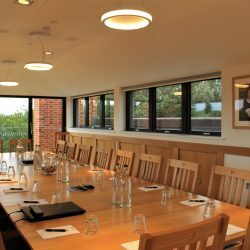 The Lewis room has been purposely designed as a boardroom, taking 14 delegates comfortably. The room has built in audio visual equipment, natural lighting and exceedingly comfy chairs. Petite opulence – seating up to 12 guests, the Gibson Room is a small but perfectly formed room and although it’s the smallest of our dining rooms, it is also ideal for small board meetings. 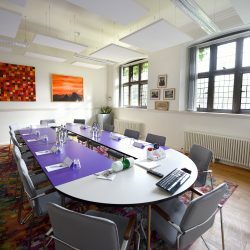 Looking out over our grounds, it works very well for working lunches too, and can be used as a fabulous break-out room for the adjacent Lewis Room (as above). 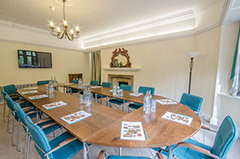 The Senatus Room is a stunning backdrop for meetings, with lovely oak panelled walls and a coved ceiling. 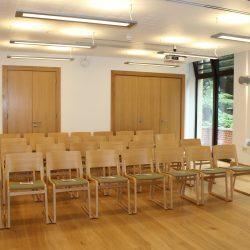 As with all our meeting rooms, audio visual facilities come as standard. Other room layouts are available on request. 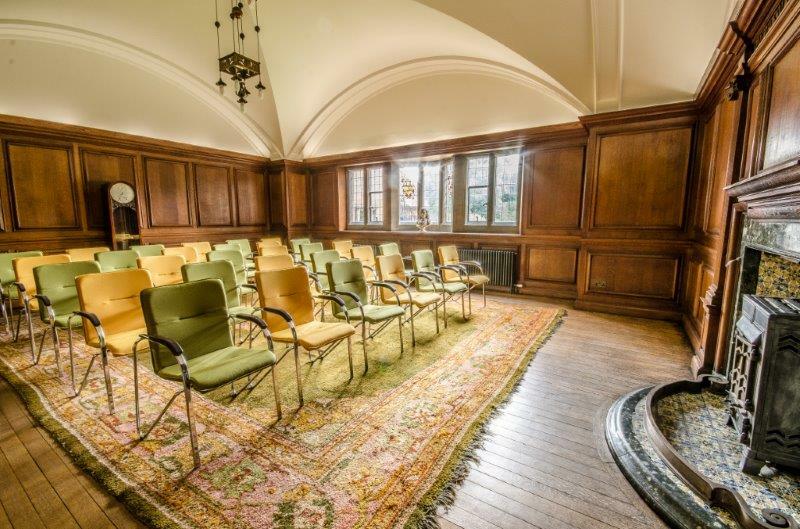 The Healey Room is the largest meeting space within Westminster College. 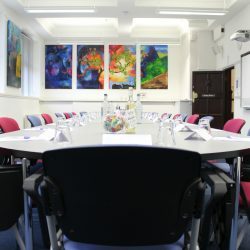 The room has been designed as a teaching room but is available to hire out of term time and for evening events. The chairs come with writing blocks, ideal for academic conferences. 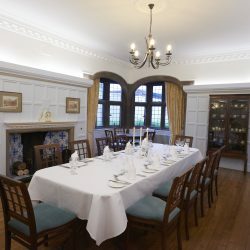 The Assembly Room is used as a meeting room and a dining room. It is a beautiful room with stunning features. The Cheshunt room has been designed to be a flexible space for a variety of uses, including arts and crafts. This room can be used in a variety of formats, seating 14 for a boardroom meeting. 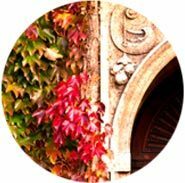 The Weston Room offers stunning views of Cambridge from an amazing vantage point. 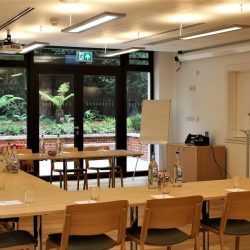 Ideal for board meetings of up to 20 people, it is a light and modern space and also works well for evening canapes receptions. 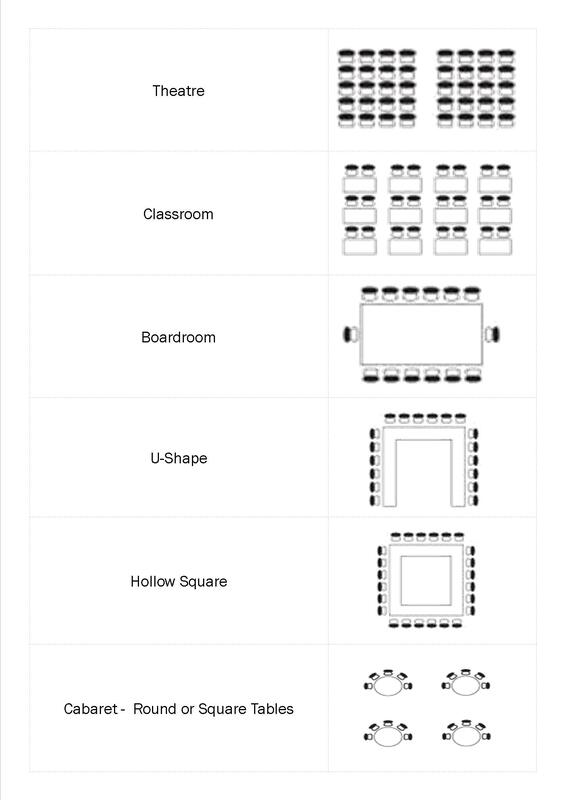 2 conference rooms in 1. The Shasha suite is made up of the Weinrebe and Grange rooms. 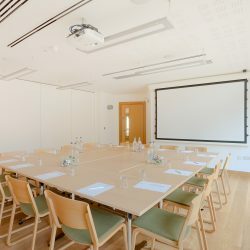 This conference suite is fully fitted with high spec AV equipment and can seat up to 75 for a theatre style conference. The Karten Room is a purpose built board room for six people. 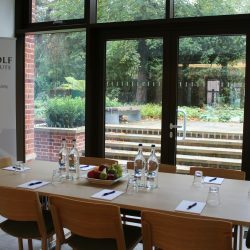 It is on the ground floor of the Woolf site and is ideal for small meetings are as a syndicate room for larger conferences. The Grange room is the smaller of the two rooms that make up the Shasha Conference Suite. It is a light and modern room with a built in projector than can run independently when this room is separated from the Weinrebe Room. Situated on the ground floor, it looks out onto the Westminster College campus grounds. The Weinrebe room is the larger of the two rooms that make up the Shasha Conference Suite. 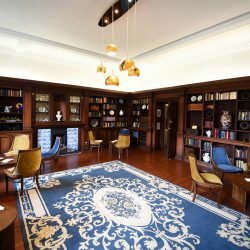 It is also a light and modern room with a built in projector than can run independently when this room is separated from the Grange Room. Situated on the ground floor, it looks out a secluded terrace which is an ideal space for breaks during warm sunny periods.